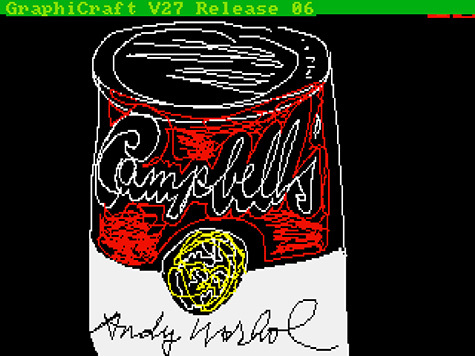 So this is a pretty neat thing: artists and retrocomputing enthusiasts have worked together to uncover a collection of previously unknown works by Andy Warhol from 1985, pieced together from files on aging floppy disks. The coolest bit, I think, is the recovery effort was kicked off when the artist Cory Arcangel watched a video demo of Warhol using an Amiga to paint Deborah Harry, and on a hunch went digging for more from that era. © 2014 The Andy Warhol Foundation for the Visual Arts, Inc. / Artists Rights Society (ARS), New York. Used here for commentary and criticism in accordance with the fair use doctrine. One thing that might seem surprising is the copyright notice on each of the works. It’s listed as © 2014 The Andy Warhol Foundation for the Visual Arts, Inc. / Artists Rights Society (ARS), New York. But it’s actually totally correct: copyright notice hasn’t been required on works since 1989, but when it is given, the date refers to the first publication date—not the creation date. 1That’s per the Copyright Office’s Circular 3 [pdf]. Why might that matter? For one thing, it could possibly affect the duration of the copyright term. The works are described as “the products of a commission by Commodore International,” but it seems unlikely that they are considered a work-for-hire. If that were the case, copyright would last for 95 years from first publication—in this case 2109. If the earlier date were put in the notice, copyright could be found to expire that much earlier, as soon as 2080. But if it were a work for hire, it’d be Commodore, and not Warhol(‘s Foundation) that held the copyright. That’s not the case. Instead, it’s just a standard unpublished work, so copyright lasts for Warhol’s life plus 70 years: until just 2057. Anyway, for the most part this is an exciting find for art history. But there are a few things I find really sad. For one, the fact that his works will be locked up until 2057 is terrible. His fondness for appropriation just lends a grim irony. Of course, by understanding what the copyright notice date meant I got the work into the public domain almost 50 years earlier, but that ambiguity can still cast a shadow of uncertainty over the use for decades. Also, of course, a “stronger” copyright system could have prevented Arcangel from ever seeing the Warhol video that led to this discovery. “Strong” copyright encourages rightsholders to publish works only in ways that will provide known value; discoveries like Arcangel’s are the kind of surprise value that a more lax system allows. It’s sad, too, that the hurdles these retrocomputing experts faced are exacerbated by DRM and anti-circumvention laws. And without the cooperation of the Warhol foundation, this restoration work could have been deemed impossible. Advocates for stricter copyright like to wave the flag of the artists. But surely the fact that so much art history is at risk hurts those artists, too. 1. ↑ That’s per the Copyright Office’s Circular 3 [pdf].